The Arboretum will partner with UA Museums to host the Tuscaloosa Nature Challenge on Saturday, April 27, 2019. Expert scientists and naturalists will lead tours and teach the community to identify organisms. There will be special tours geared to children and families! Data collected will be uploaded using the iNaturalist app to compete with other groups in the Birmingham area and across the country. More information to follow soon! Update! The Arboretum is open Tuesday, January 29, due to better than expected weather conditions. Nothing to do with your “snow” day? Come visit the Arboretum! The Arboretum will be closed tomorrow, Tuesday January 29, due to expected inclement weather. Unless otherwise announced, we will follow the UA closing schedule. At this time, UA plans to resume operations at 11 pm on Tuesday, January 29, and the Arboretum will reopen at 8 am Wednesday, January 30. We will continue to monitor weather conditions and update as needed. We’re hiring! Full-time positions with benefits! We’re hiring! Two full-time staff positions are available: Arboretum Caretaker and Arboretum Office and Grounds Assistant. Visit https://arboretum.ua.edu/about-us/jobs/ for more information. For detailed job descriptions and to apply, visit UA’s employment website at staffjobs.ua.edu. Graduating seniors, part-time students, and prospective students will be given full consideration. We will be closed Thanksgiving Day, Christmas Day, and New Year’s Day. All other days we will be open on our normal schedule, 8 am – sunset. UA Researchers Drs. Eben Broadbent and Angelica Almeyda Zambrano, along with undergraduate student Kathryn Shay, are piloting use of audio recording technology for bird monitoring at the Arboretum. Saturday and Sunday, November 14 & 15, Arboretum staff will coordinate volunteer workdays from 9 am to 5pm. Tasks may include weeding, planting flowers, mulching, picking up fallen limbs or hauling brush. You may come for as little or as long as you like. We will provide gloves and tools as needed but you are welcome to bring your own if you prefer. Please wear boots or closed-toe shoes, dress in layers, and expect to get dirty. Bring your water bottle and pack your lunch and snacks if you plan to stay the day. If you have any questions, please email us at ua.arboretum@ua.edu. 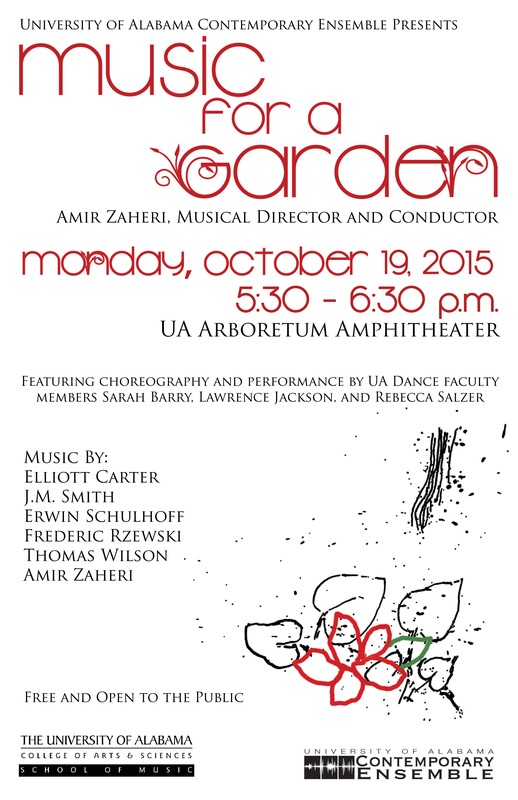 Join us on Monday, October 19, for an early evening concert in the Arboretum Amphitheater! The Crimson Classic cross country meet is scheduled for Friday, October 16. Pets will not be allowed through the front gate this week due to the issues with owners failing to clean up after them. On Friday, access through the front gate will be limited to the cross country meet. Arboretum visitors will need to enter through the back gate on Pelham Heights Road. Leashed pets are welcome at the Arboretum; please clean up after them.